We’d love your help. Let us know what’s wrong with this preview of The Nature of Grace Box Set by S.R. Johannes. The NATURE OF GRACE books have hit many of the top young adult/teen and thriller bestseller lists including: Best Debut, Movers and Shakers, Top 100 in Thrillers, and the Top 100 in Teen Action Adventure books. This new Nature of Grace Exclusive Box Set is for readers who love wilderness thrillers. 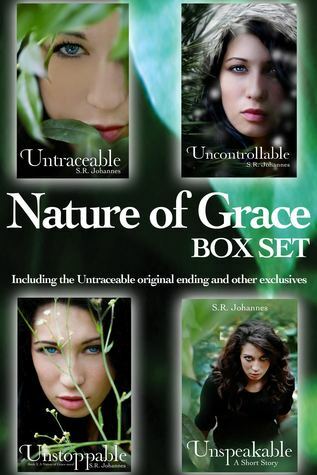 The box set includes all 3 books in the Nature of Grace Series (Untraceable, Uncontrollable, and Unstoppable). It also includes an exclusive short story, Unspeakable, from Mo's perspective as well as the original Untraceable before it was changed. Untraceable (Book 1) - When Grace's forest ranger dad disappears on patrol, she fights town authorities, tribal officials, nature to prove he’s alive. Torn between a hot boy and cute ex, she heads into the wilderness to find her dad. Soon, she is caught in a web of conspiracy, deception, and murder. Uncontrollable (Book 2) - When Grace enters the Red Wolf Reintroduction Program, and when wolves start showing up dead, Grace must work through her fears and hunt down clues to find out who is sabotaging the wolf program and why. Little does she know, she is being hunted too. Unstoppable (Book 3) - When Grace moves to the Everglades to live with her grandmother, Birdie, she becomes friends with Dylan and his girlfriend, fellow animal activist, Sadie. After finding an injured Florida Panther, she stumbles upon a large roadside zoo illegally filled with a variety of endangered and exotic animals. There, she and her friends are kidnaped by the ruthless owner and dragged deep into the Everglades for a hunting challenge. Only this time, Grace is the prey. To ask other readers questions about The Nature of Grace Box Set, please sign up. When Shelli was younger, she spent all her time outdoors, hiking, camping and living the Girl Scout Way. Eventually, Shelli traded in her expensive suits, high heels, and corporate lingo for a family, flip-flops, and her love of writing. She started her own When Shelli was younger, she spent all her time outdoors, hiking, camping and living the Girl Scout Way. Eventually, Shelli traded in her expensive suits, high heels, and corporate lingo for a family, flip-flops, and her love of writing. She started her own marketing & communications business, www.bilaninc.com, where she worked with Spanx, Goody Hair Products, Chick Filet, and the Boys & Girls Club of America. In addition to juggling nap schedules and client meetings, Shelli focuses on her writing. She is a frequent speaker on marketing and book publicity at SCBWI conferences across the U.S, and runs a popular book marketing blog, Market My Words (www.faeriality.blogspot.com).